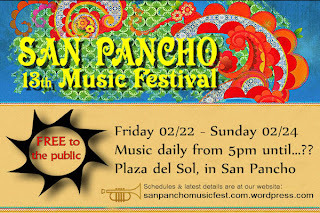 In Riviera Nayarit music is our luxury, which has attracted international artist to perform during 13th San Pancho Music Festival to be held February 22-24 offering no charge to the public concerts at Plaza del Sol in San Francisco (aka San Pancho). The Music Festival will feature performing artists from the region of Riviera Nayarit, Mexico, as well as musicians from the United States and Latin America. The event will begin at 5pm each day, with performances up until 11pm each night. A schedule of performing artists and show times will soon be published on the Festival website as details emerge. 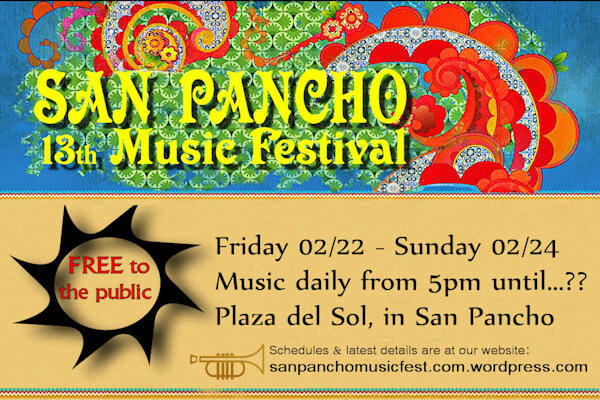 San Pancho’s Music Festival is a vibrant, eclectic expression of performing art traditionally held annually for 3 days during the last weekend of February. It began informally in 2001 as a backyard venue of a local resident, and by 2006 included some 116 performers. It has progressively grown ever since, attracting some of the most colorful musicians from around the world. The Festival has become a cultural tradition in San Pancho. Traditionally there is no fee to attend, and performers are not paid. The Festival is entirely supported by the gracious contributions of local musicians and international recording artists, and by the local residents of San Pancho. Artists come to perform because they enjoy performing in the intimate venue and magical surroundings of San Pancho. It is a truly wonderful balance of amateurs and professional performers coming together for 3 days to share an unforgettable and enriching musical experience in one of the most beautiful regions of Mexico. Donations are encouraged, but there is no intent for the Festival to profit from the performances. Additionally, proceeds from sales of music and video CD's go directly to the performing artists. This year the Music Festival returns to Plaza del Sol. In 2012 Plaza del Sol was remodeled and it’s facilities updated. A new stage was completed to enhance the Plaza as an entertainment venue. Public restrooms were modernized, the portico was remodeled, and new landscape installed. The Plaza is now better suited for the ever increasing crowds drawn to the community celebrations and festivals. To be automatically informed of Festival news and latest changes, take advantage of the Festival's email subscription service on the website.